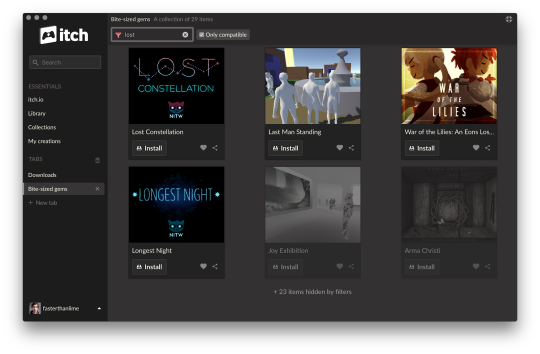 We’re proud to release the next big version of the itch.io app, itch. This is a major release, with over 600 commits since v17.6.6. You can view the entire changelog on GitHub. If you already have downloaded the app you can start it up and it will automatically update. If you don’t have it yet, you can download it here. In the previous release of the app we integrated game pages directly into the app via a built in browser. The browser & tab based navigation is still there, but with many improvements to make discovering, installing, and playing as smooth as ever. Search has been completely overhauled, and now can be used to search from itch.io’s database and filter content that you’ve interacted with in the app. You can find it below the itch logo, on the updated sidebar. On a project page you’ll find a new right sidebar. There you’ll see any primary game information, as well as buttons for downloading, installing, and buying. There’s even a tip button to support creators of free games. We’ve also made it clear what versions of files are available for for game. With more and more people using refinery’s patching, you’ll be able to take advantage of incremental updates for many more games. Browsing through collections is fast and efficient, especially for those with many collections. The new collections overview page gives you a preview of the collections you have with 4x4 thumbnails representing the games and content within. By default we now filter out content that is not available on your platform. Additionally, you can filter quickly by name or keywords. If you’ve got 100s of games in a collection, the game you’re looking for is only a few key presses away. If a new user interface wasn’t enough, the download manager now includes a handful of new functionality. You can pause and resume downloads in addition to setting their download order. Running files downloaded from the internet always has some inherit risk. 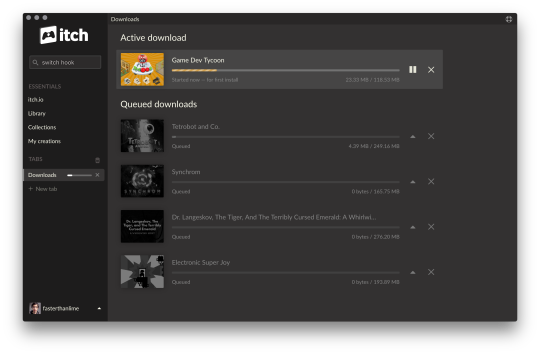 We want people to feel confident when downloading games and tools from itch.io without having to worry about malicious developers. The itch.io sandbox addresses this by running all content in a separate account on your system with restricted permissions. It’s completely transparent, you’ll still click “Launch”, but you’ll have the benefits of the sandbox. A system like this is complicated, and there are many intricacies from platform to platform. Although we’re launching it with v18, it’s marked as experimental, and is not enabled by default. We recommend you use it, but if you run into any issues you might have to temporarily disable it. Games and tools launched within the app now have access to the itch.io API via scoped API keys. Additionally, we’ve introduced a new manifest format to help developers instruct how their executables can be discovered by the app. itch.io API integration is available both to native games and HTML5 games (launched with the itch app). For more information, read the documentation. Manifests are described in detail in the itch app integration guide. A press account is a special account on itch.io that lets members of the press or games media get access to games to review without having to pay. The app now lets press users download directly from the app via the new “Review” button. There really is too much to list in this blog post. Check the changelog for everything else, and more details about the things listed above.